Ashley Gorley maintains the No. 1 position on the MusicRow Top Songwriter Chart this week for the second week. Gorley was MusicRow‘s 2018 Songwriter of the Year at the CountryBreakout Awards. The 2019 Songwriter of the Year honor will be given Wednesday (Feb. 13) at the 2019 Awards. Repeated from last week, Kevin Welch is at No. 2 and the 2019 Grammy “Best Country Song” co-writer, Shane McAnally, is at No. 3. Brett James follows at No. 4. 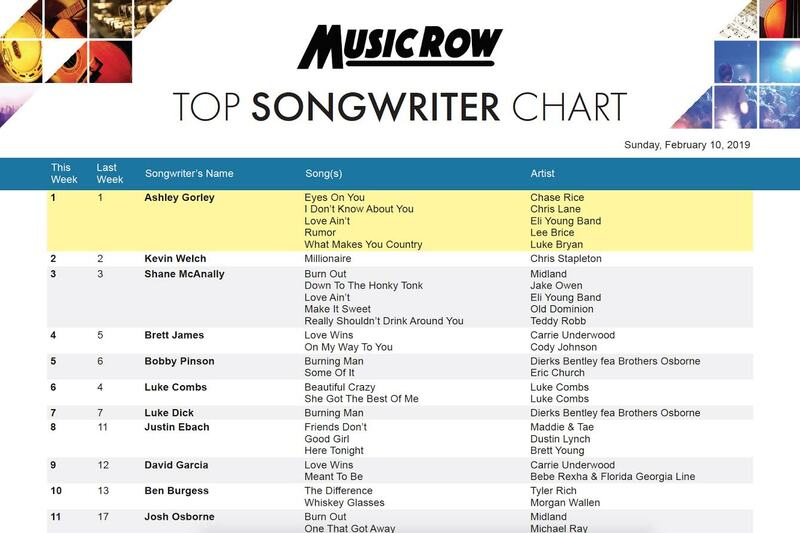 Bobby Pinson moves into the top five with Dierks Bentley’s “Burning Man” and Eric Church’s “Some Of It” propelling him.